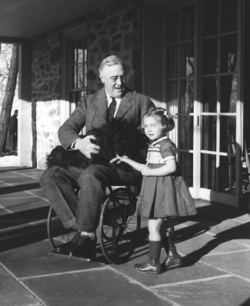 Franklin Delano Roosevelt’s four-term presidency spanned two great national and international upheavals — the Great Depression and World War II — which both triggered major effects on immigration. During the early years of his presidency, Roosevelt loosened instructions put in place by Herbert Hoover banning immigrants “likely to become a public charge.” In the late 1930s a European crisis spurred by the rise of Nazi Germany generated hundreds of thousands of refugees who wished to come to the U.S. At the time, the country had no formal refugee policy, so those who wished to come were forced to apply under the country-by-country quotas in place. In June of 1939, the waiting list for one of the visas allotted to German-born immigrants stood at over 300,000. Between 1938 and 1941, 123,868 Jewish refugees had immigrated to the U.S., but many hundreds of thousands more had applied at U.S. consulates abroad but were unable to immigrate. After the war began, Roosevelt enacted two additional policies relating to immigrants in the U.S.: the Feb., 1942 Executive Order 9066, which mandated the internment of Japanese Americans (both immigrants and native-born citizens) in camps in the western U.S. More than 110,000 Japanese Americans were interned until 1945. In 1942 Roosevelt also created the Bracero Program in an agreement signed with Mexico. The program allowed for immigrant laborers to temporarily come to the U.S. from Mexico with various guarantees as to minimum wages and acceptable living conditions. During the 22 years that the Bracero program operated, it oversaw employment contracts for five million workers in 22 U.S. states.